Step 1: Choose your paper. For this type and size of pail, you will need 2 sheets of 12×12 designer paper (DP) to cover the pail, 1 sheet of a coordinating paper and three colours of 8.5×11” cardstock. I think I ended up using 2 of each celery and white and one of banana. 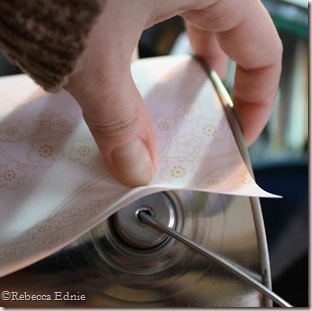 You could use two different patterned papers to cover the pail, but then you will have to be WAY more precise with your placement to get it even on both sides. I don’t recommend it. Step 2: I started with my lid. 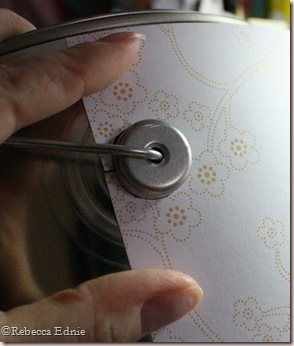 Use a circle cutter or appropriate sized circular item to trace and cut cardstock. 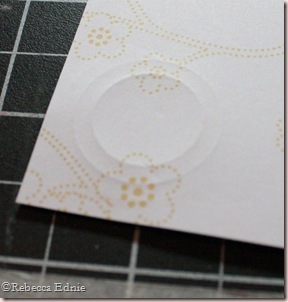 Cut another, slightly smaller, circle from the single sheet of DP. (I ended up using two different kids bowls from IKEA to cut mine.) 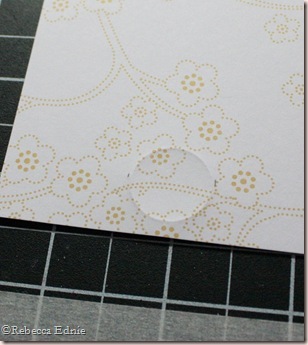 Cut the largest of the large set of scalloped circle Nesties from cardstock. 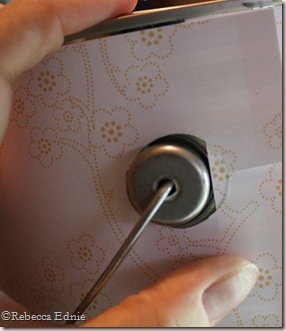 I embossed mine with a Cuttlebug embossing folder. It just fits the width of the folder! Cut another from the largest of the small set of plain circles. 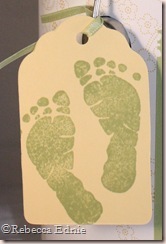 Stamp a background on it or embellish it with stamping or die cuts. Adhere in layers as shown here. I used a SU! bear which I sponged to give him more depth and rosy cheeks. sive the same as the back. Tricky part over! Step 4: Create the front panel. The green cardstock is 8.5” wide and the white is 7.5” wide but I don’t have the other measurements and the punch took some off anyway. This is the fun part!! Decorate this panel anyway you like. I used a Sizzix alphabet to cut my letters. You could of course stamp them, use letter stickers or rub-ons. TIP: If your letters are small enough, put several dies through on one ‘crank’. I managed to do all those letters with only two passes. I lost the dot for the letter ‘i’ so I cut the prongs off of a brad, used dimensional glaze to fill in the back and once it was partially set I added it to the white panel. Not only did I forget to put the brad through the paper until after the layer was adhered, of course! but I also wouldn’t want the brad prongs to show through. My BFF makes these gorgeous Irish crocheted flowers. Email me if you want to order some of these. We haven’t set up the official post yet but she is almost ready to make more. Any colour, minimum order of $8 CAN. (There are other styles too, mix and match) We can match floss to SU! or PTI colours or send us the floss colour numbers you want. Step 5: Finish any other decorating you choose. 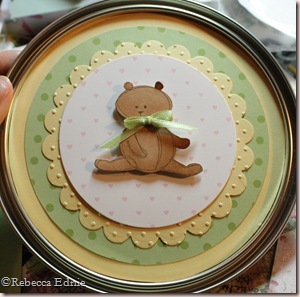 Maybe add a ‘Made by…” tag on the back or add ribbon to the top and bottom edges like I did. I put my ‘made by’ tag on the inside of the lid. Along with my contact info, I’d love to make these to sell! Kids grow up quick, much too fast. 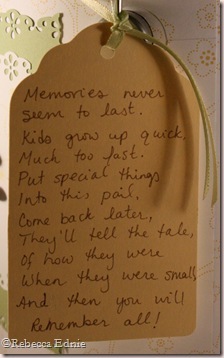 And then you will remember all. The middle tag is a bit too big (I already trimmed it some) but I like it anyway. I used SU! markers to colour the images. 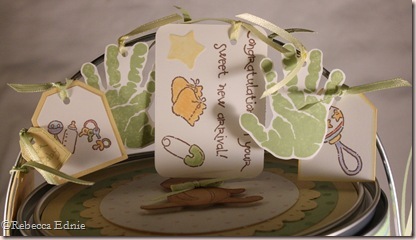 …8 cards with matching envelopes! I also wanted to add a small notebook with pages listing special dates, occasions and ‘firsts’, kind of like a baby book but just for her to write in things quickly before she forgets. She can scrapbook them or write them in a proper baby book later. 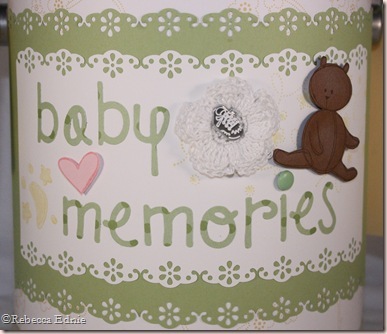 Accessories: ribbon-Offray, striped ribbon-Taylored Expressions, Nestabilites, Cuttlebug embossing folder, Markers, word window punch, large and small tag punches, Crop-a-dile, green and baby shoe brads-stash, Sizzix alphabet. All products by SU! unless otherwise noted. I really appreciate your tutorial. 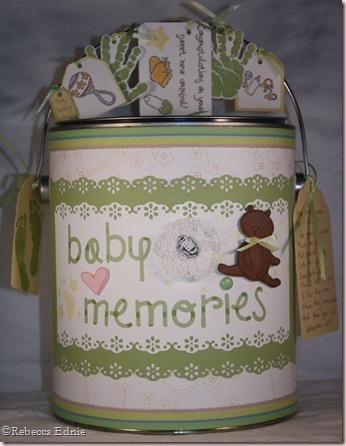 The pail is adorable and a perfect baby gift! This is a really cute tin. I'm sure she loved it. Ohhhh how cute is this!!! I absolutely LOVE IT!! !